Sister is back in Late Nite Catechism 3! This year marks the 20th anniversary of Late Nite Catechism, an interactive comedy and one of the longest-running shows in Chicago and United States theatre history. The show has visited every state in the U.S. as well as Canada, the U.K. and Australia. In this unique one woman show, Sister teaches students about all things Catholic. Now after years of doing so, Sister is ready to turn her attention to the topic of marriage with the production of ‘Til Death Do Us Part: Late Nite Catechism 3. Called part catechism class and part stand-up routine, she’s back in Omaha with the third installment. Written and created by Maripat Donovan and Vicki Quade, the series has seen much success. Donovan found her inspiration at a dinner party in 1992. After hearing Donovan talk about St.Maria Goretti (the patron saint of virginity), a friend said to her, “This is so funny. You should do something with this.” That’s exactly what she did. Donovan contacted an acquaintance who ran a theatre in Chicago and created the first show of note about a nun since the musical Nunsense. Donovan and Quade wrote the original Late Nite Catechism in about three weeks and it premiered in 1993. 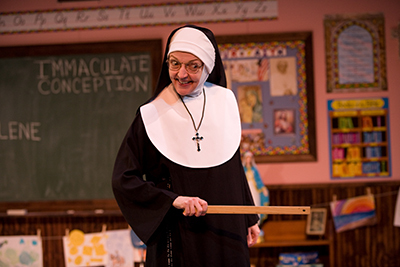 Since the first production, audiences world wide have been pupils in Sister’s classroom, with five different versions of the show. ‘Til Death Do Us Part: Late Nite Catechism 3 is focused on the Sacrament of Marriage and Last Rites. Sister even presents her own wacky and hysterical version of the Newlywed Game, using audience members as contestants. Be sure to grab your significant other and your sense of humor and visit the OmahaCommunity Playhouse for some special couples counseling from Sister. The show runs from June 14, through July 21, 2013 in the Howard Drew Theater; Wednesday–Saturday, 7:30 p.m., and Sunday, 2:00 p.m.
Tickets are $35 per person. For groups of 12 or more, tickets are $32 per person. To purchase tickets, or for more information, call (402) 553-0800, visit the OCP Box Office or click here. Become a BizTix subscriber and receive $12 tickets! Be a part of Carl Beck’s and Susie Baer Collins’ last season as they, along with your favorite performers, transport you to other times and worlds. An exclusive BizTix subscription contains ten ticket vouchers to each of our ten season productions (including Les Misérables and A Christmas Carol) for you to wow and woo your clients or reward your employees. You receive a total of 100 tickets for $1,200. That’s only $12 per ticket for productions that are regularly priced at $35-$40 per ticket! You can even receive a significant discount on Prompter advertising with a BizTix Plus package. To subscribe or for more information, call or email Lora Kaup, director of sales at (402) 553-4890, ext. 147 or lkaup@omahaplayhouse.com. Omaha Community Playhouse's 21 & Over program presents Enron. 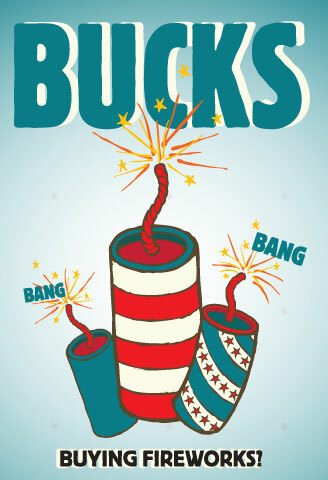 Illuminate your Fourth of July! The city of Omaha is allowing the sales of fireworks again this year within city limits with sales benefitting a sponsoring nonprofit organization. Sales begin on June 24, 2013, and last until July 4, 2013. OCP participates in Omaha Gives! The Omaha Community Playhouse is proud to be participating in Omaha Gives! - a 24 hour charitable challenge organized by the Omaha Community Foundation. The online giving holiday will take place May 22 from midnight to midnight. Mark your calendars because we will need your help! We will be joining nearly 300 local nonprofits to raise money together and compete for matching funds and prize money. The more money we raise, the larger percentage of the match pool we will receive. The more donors we get to give to us, the more likely we are to win prize money. Omaha Gives! is a one day event led by the Omaha Community Foundation to raise as much money as possible for local nonprofits through online fundraising. It is a community-wide event to show off Omaha’s spirit of giving, raise awareness about local nonprofits, and celebrate the collective effort it takes to make this city great. Learn more at OMAHAGIVES24.ORG. How can you help the Omaha Community Playhouse during Omaha Gives!? · Donate to us on May 22! Visit OMAHAGIVES24.org on May 22 and donate to OCP. Or visit OmahaPlayhouse.com and we’ll direct you there. · Spread the word! Tell your friends that you will be giving to OCP during Omaha Gives! on May 22 and that you need their help. · Share the Social Media love! By friending us on Facebook and following us on Twitter, you can help spread the message about OCP’s participation in Omaha Gives! You can find us at facebook.com/omahaplayhouse and @omahaplayhouse. · Cheer us on! On May 22, watch the leaderboard on Omahagives24.org and update our progress on social media. · Save the date. May 22, 2013 will be a great day of generosity in Omaha. Get excited and ready to share your enthusiasm for OCP throughout the day. Thank you for your ongoing support of OCP. We can’t wait to see the Omaha community band together to give. After a largely contemporary season, which included two world premiere productions, the Omaha Community Playhouse closes out the season with a true classic. We have all have heard of The Wizard of Oz, right? Well, if not, now is your chance to come to OCP and experience this thrilling and entertaining musical that is perfect for the entire family. Come see your favorite characters such us Toto, the Tin Man, the Scarecrow the Cowardly Lion, the munchkins and so much more. Most of all, come see the one girl that brings all these one of a kind characters to life. 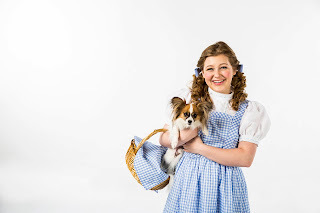 Meet Charlotte Hedican, wait, I mean Dorothy Gale, a farm girl from Kansas, who just wants to find her way back home after a tornado drops her off in Munchkin Land. Charlotte Hedican, who plays Dorothy Gale in the OCP’s production of The Wizard of Oz, is just your average high school Sophomore who is balancing school and a starring role. I had the opportunity to talk with Charlotte and ask her some questions about her upcoming role as she balances school and prepares for such an iconic character. What are you using for inspiration? How do you handle school and acting at the same time? Is it difficult to memorize lines and study at the same time? Did you ever watch the The Wizard of Oz growing up? “Yes, I did. My grandma passed down her love for the series to my mom, who passed it to me. My mom owns all of the books, including copies that are quite old and originally bound. I never got into the series, but I've read the original The Wizard of Oz. What’s the most exciting part for you, when taking on this role? Don’t miss out on this beloved and heartwarming story. Follow the yellow brick road to OCP and help Dorothy find her way back home. 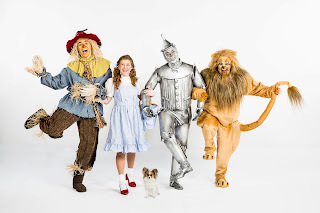 The Wizard of Oz will be live on stage in the Howard and Rhonda Hawks Mainstage Theatre, May 31, through June 30, 2013; Wednesday–Saturday, 7:30 p.m. and Sunday, 2 p.m. Enjoy the arts with a Metro Arts and Culture Pass! If you are a season subscriber to the Omaha Community Playhouse, in the month of May, you can receive $3.50 adult admission (regularly $7) to Fontenelle Forest and an offer to Kaneko found at Facebook.com/metroartspass.